If you haven’t been to Boulder Beer recently (or ever), this is a call for action! EDB was recently invited to experience Boulder’s iconic and newly remodelled location on Wilderness Place and, of course, we gladly accepted. As the afternoon unfolded, we found a quite a few more big surprises along the way. The quick readout is that the next time you go to Boulder Beer you will find a new place, a new menu, new brews, plus, new brunch (!) on the weekends. But, you will also find all of the same great service, staff and ultra chill vibe you’ve always enjoyed. Intrigued? Read on for details. A bit of history first. 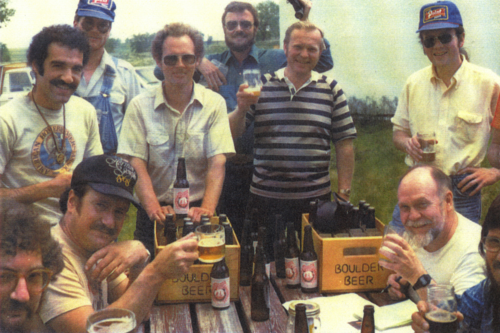 Boulder Beer was our first and, at one time, only craft brewery in town. Founded in 1979, as an experiment on a goat farm, this company started taking off way before craft beer was a thing. Soon thereafter, Boulder Beer designed and constructed its current location on Wilderness Place, which has been a favorite haunt for locals and students alike ever since. The environment was already exceptional, if a bit dated, whether you are gathering with friends outdoors on the oversized patio, enjoying the Flatirons in view, hanging inside with your buddies on a cold day or playing weekly trivia with colleagues. Well, it’s still the same building in the same great location but, the interior/exterior remodel has significantly modernized most of the place, especially the gathering room just off to the right as you enter the building (what I call the Trivia room). A smartly placed, oversized barn door entryway and a set of openable garage doors on the western wall allow the space to breathe and expand easily, which presents you, as the guest, with a lighter feel that is more inviting than ever before. Additionally, the large outdoor patio has been thoughtfully updated and expanded along the entire west side of the building, providing more gathering space with several new picnic tables installed and all with the same great view. 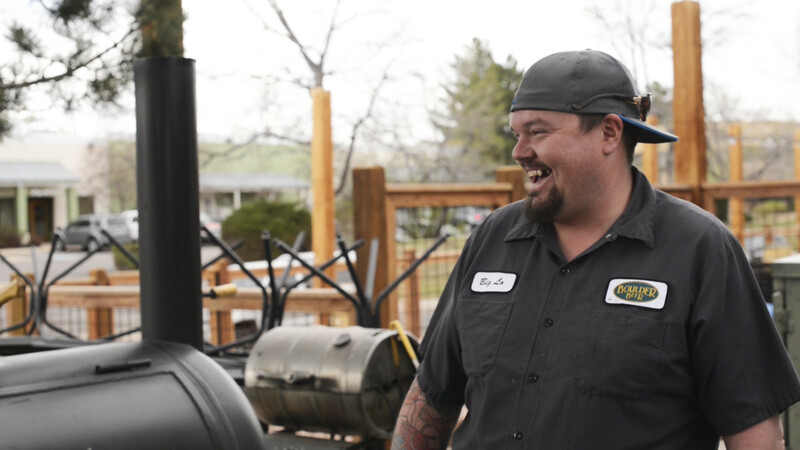 The biggest surprise for me on our visit was the complete revamp of Boulder Beer’s food menu, with much credit due to newcomer on the scene, Chef Logan. His fresh take on the menu leads to deliciously, meticulously crafted dishes we all enjoyed. Not only does Chef exhibit a complete mastery of the smoker and methodical slow cooking techniques – all of the dishes have a well designed flash finish in the kitchen – adding a bit of zest here, crispness there. Chef Logan has raised the bar and this is possibly the best pub food in Boulder. Chef Logan also possesses an amazing talent for developing sauces of all kinds and does a great job formulating and pairing sauces with each dish. Think Vestas Dipping Grill in Denver, only more cozy, totally down to earth and much closer to home. Try as many as you can. Everything we tasted was delicious and our group unanimously agreed that the dishes were well executed, leveraged innovative flavor combinations and were delivered as thoughtful presentations on the plate. The ribs were an immediate fan favorite at our table. Fall off the bone, juicy tenderness yet crisp on the outside. Nice. Vegans, Vegetarians and Gluten sensitive friends will not feel left out. There are plenty of choices for you to enjoy but our GF friends should be aware that some of the sauces contain beer, which does have gluten. Boulder Beer favorites are available year round – Buff Gold, Mojo, Hazed, Singletrack, Sweaty Betty, Shake Chocolate Porter and Pulp Fusion. I might not proselytize BB quite as much as I do with Avery, but if you’re wanting good beer, you will find some great classics here. What I didn’t realize until our visit was how many “Seasonal & Limited Release” beers are in the mix – like Mojo Risin, Irish Blessing, Hola Maria, Bump ‘n Rind ( PS – loved it), Dragonhosen and the entire Dude Series, which I cannot wait to try and I’m totally late to this party. It also looks like we’ll quickly see an expansion of this line as Shay Castle of the Daily Camera reports, Boulder Beer has recently acquired Walnut Brewery where there will be even more room for experimental Boulder Beers this summer. Great news for Boulder but, I can only hope that Chef Logan has a hand in developing a new menu over there. If you are reading this at publishing time, you’re probably in the mood for comfort food on this incredibly snowy weekend in late May – who said Mothers Day was safe for planting my Spring garden?! Boulder Beer’s Brunch will definitely satisfy. But, on any given “normal” weekend in Boulder, whether you’ve hiked Sanitas, biked a 100 mile loop or completed your week’s worth of Muay Thai / kickboxing classes you will have solidly earned a Boulder Beer Brunch. We suggest the Smoked Brisket Breakfast Burrito or Waffle Sliders and pair with any range of Boulder Beer cocktails, or go out on a limb and try the bottomless “Beermosa.” A full bar is available for non-beer drinkers so, go ahead with the Bloody Mary’s and I have long enjoyed Boulder Beer’s Margaritas. Yep that is kinda weird but pairs perfectly with nachos. If you like how things are made, you can enjoy the 2pm daily tour. We’d all love to go back with the bottling and canning is happening. Yeah, just because we’re nerds about that kind of stuff.